The 336C is the flagship of Marlin's Model 336 family, and one of the most popular hunting rifles in North America! The 336C embodies Marlin®'s dedication to dependability, pinpoint accuracy and good looks. A 20" barrel with MicroGroove® rifling makes it exceptionally handy in the brush-not to mention deadly accurate. The American black walnut stock and fore-end are enhanced with fine-cut checkering and the extra-tough Mar-Shield® finish. Marlin 336C, Lever Action, .35 Remington, 20 Barrel, 6+1 Rounds is rated 5.0 out of 5 by 6. Rated 5 out of 5 by KentD from Thumper .35 This is my 4th Marlin and I couldn’t be happier. The .35 Thumper doesn’t disappoint. Great fit and finish, smooth action and an overall great looking rifle. SG always has the lowest price!!! I now have the model 60 in .22lr, 336W in .30/.30, the 336c in .35 rem and the 1894 in .44 mag. I guess I’ll eventually get the 1895 in .45-70. You can never have too many lever guns! Rated 5 out of 5 by glindy from Glad they kept the Marlin name My old Marlins were great. Then they sold the company and everyone said the new ones were junk. Well I just bought a new one in .35 and it is still a great gun. I inspected the gun from end to end and found high finish quality for a reasonable price. It functions perfectly and hits what you aim at, I see no issues with this gun at all. I would have no issue with buying another or recommending them to anyone else to purchase,everyone needs a few lever action Marlins in the gun case. Rated 5 out of 5 by palmer from FINE RIFLE yep fine rifle, cant wait till deer season. Rated 5 out of 5 by blackthorn from Price was great This is my fourth Marlin Model 336 cal 35. I have given one to all my family members as this is my favorite rifle. It shoots well is easy to carry has a lot of punch to it and can be used on a lot of big game. Rated 5 out of 5 by ArchieRLib from Old school reliability. In every way. The more I have hunted, the more I have shunned the age of "mega-blaster magnums" that kill through mainly through hydrostatic shock (even with relatively poor shot placement), and NASA-power optics to look at an animal a state away. Neither are really necessary and are, in fact, crutches for poor skills and gun magazine fodder, in that order. 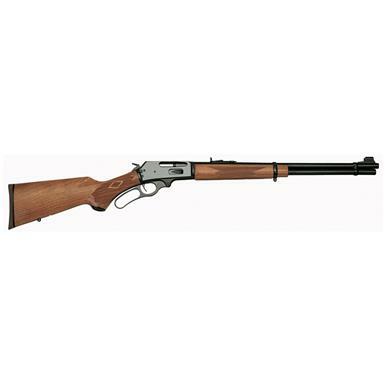 I hunt in the high western mountains and will tell you that this Marlin rifle, with the proper quality .35Rem ammunition (say, Buffalo Bore, or Hornady), with a good quality 2-7X power scope, will protect you against predators and harvest anything you need to out to 200 yards in North America. Mule deer, elk, bear, lion, caribou, moose. With advances now in ammunition, it is easily the most versatile and effective close cover hunting rifle ever made. Marlins and 30 cals have been doing it for a long, long time before the ubiquitous opus magnum came along. Personally I believe if you are shooting farther than that for game, you are missing the point. This rifle has helped me rediscover what it means to hunt. And it's a Marlin. Very well crafted. Reliable. Sturdy. Easy on the eyes and the wallet. Thank you Marlin for keeping the thumper 35. Rated 5 out of 5 by Papaw 16 from The BEST PRICE I found ANYWHERE!!! A very nice rifle , just beautiful! Deep dark blueing and perfect wood to metal fit and buttery smooth action! YEP! This 'uns a KEEPER!!! Can't beat SPORTSMANSGUIDE!! !